Conditions inside the Fukushima nuclear plant in Japan remain grim and shambolic eight months after the site was devastated by an earthquake and tsunami, according to the first journalists allowed inside since the disaster. Officials showed reporters around the plant for the first time since March when the natural disasters triggered a meltdown in three of the plant’s reactors, the worst nuclear accident since Chernobyl 25 years ago. Martin Fackler, the New York Times’ Tokyo bureau chief, said the site was strewn with piles of rubble virtually untouched since the tsunami struck. He said: “There’s debris all around where the reactors are – twisted metal, crumpled trucks, large water tanks that have been dented and bent. “You can see that this stuff has been strewn around and it has not been picked up and it’s been there for eight months. Radiation levels were still “very high”, he told BBC Radio 4’s Today programme. The tour was aimed to show that the situation at the plant was slowly improving. The Japanese authorities have previously denied media requests to visit the site, on the grounds that radiation levels were too high and it could hinder the clean-up operation. The reporters, mostly from the Japanese media, were accompanied by the environment minister, Goshi Hosono, who is in charge of the clean-up operation. They were not allowed near the reactor buildings. Tokyo Electric Power (Tepco), which runs the plant, has succeeded in bringing down the temperatures at the three damaged reactors from levels considered dangerous. “From the data at the plant that I have seen, there is no doubt that the reactors have been stabilised,” Masao Yoshida, the chief of Fukushima Daiichi plant, told the reporters. But while it was now possible for workers to enter the reactor buildings, Yoshida said conditions for those working there remained dangerous. Tepco hopes to complete a “cold shutdown” – when temperatures are stable below boiling point – of the damaged reactors by the end of the year. But Hosono warned it could take more than 30 years to completely decommission the plant. Hiroaki Koide, a nuclear physicist at Kyoto University, said he doubted the decommissioning process will go as smoothly as the government hopes. He said pools for spent fuel remain highly volatile, and cleaning up the three reactor cores that melted down due to a failure of the cooling systems will be a huge challenge. 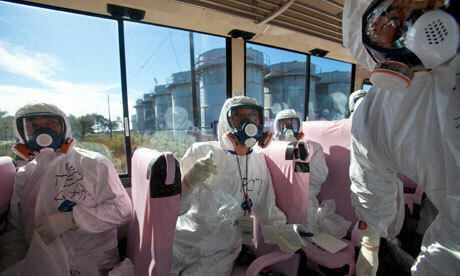 Four of the six reactors at Fukushima were badly damaged by the tsunami. There were also explosions caused by a build-up of hydrogen gas. Large quantities of radioactive material also leaked into the surrounding countryside, prompting the government to declare a 12 mile no-entry zone that is likely to be in effect for years if not decades. Officials admit that about 80,000 evacuated residents may never be able to return home.